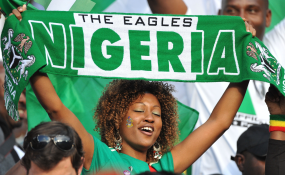 President of the Super Eagles Supporters Club, Vincent Okumagba has expressed the club's resolve to offer the Super Eagles the biggest support they can ever get from their country in order to win the forthcoming Africa Cup of Nations tournament in Egypt. Speaking to reporters after his re-election as President of the club, Okumagba said, "our immediate task is to see how we can galvanise support for the Super Eagles as they prepare for the 2019 AFCON in Egypt, and just last week I sent a letter to the Nigeria Football Federation, requesting for 200 match tickets which means we are taking two hundred members to Egypt." Okumagba's re-election was preceded by the ratification of the club's constitution by the National Executive Committee and many members said they were enjoying an air of freedom as they were allowed to make useful contributions in the running of the club.